A graduate from Mumbai University, Shibu Philips brings with him over 21 years of experience launching international quick service restaurants and state of the art shopping malls. He is one of the pioneers who transformed the retail arena of the country, with a glittering track record that dates back to the year 2000. One of the main driving forces behind the launch of three of India’s best Shopping Malls, Inorbit Malad Mumbai, Oberoi Mall Mumbai and Lulu Mall Kerala, he is a Level 3 certified Shopping centre Manager from International council of shopping centres – ICSC (USA), receiving professional recognition of the body twice during Maxi 2007 and 2014. 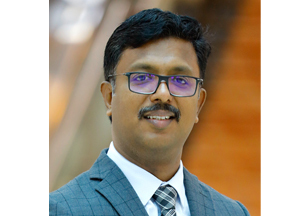 In 2010, he joined Lulu Group to play a key role in the visionary project of the MD of the group, to bring international shopping experiences to Kerala for the first time. Needless to the say, the dream was realised in record time, and Shibu Philips was part of the team that gave life to that vision. Currently he is the Business Head of Lulu Mall, making waves in a market with no prior exposure to international shopping malls, marching ahead by setting one milestone after another. He is also playing a key role in Lulu Mall’s extensive expansion plans to markets like Lucknow, Vizag, Bangalore, Hyderabad, Trivandrum and 12 other cities in India. Real commitment never goes unrecognized and recognitions came looking for him, wherever he rendered his service. Being adjudged one of the “Most Influential Shopping Centre Professional” in India is just one feather in his cap. Here are some of the achievements accomplished during his tenure at various organisations. Most Admired Shopping Centre of the Year –Metros, Shopping Consumer Insights Awards 2008. Asia Shopping Centre Award 2009, Singapore – Community Building Initiatives. A perfect family man, who loves to spend his free time with his family, he is married to Rosy Shibu who is a homemaker and is blessed with three children, Sowmya Maria Shibu, Sofiya Alphy Shibu and Sarah Rose Shibu. The Shopping Centres Association of India (SCAI), a NPO (non-profit organisation) has been set up with the vision to engage in, and encourage, the development of the shopping centre industry in India, by equipping it with the requisite knowledge base and operational skills, to enable it to assume its rightful place in the society, the economy, and the world.